24/10/11 - Museum - New York, The Frick Collection - An appointment, acquisitions, a restoration, publications... Events at the Frick Collection have moved briskly of late. 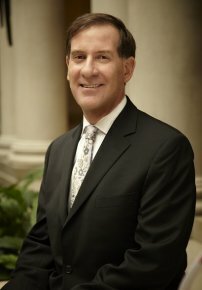 The foremost of these is the new face of this prestigious establishment, Ian Wardropper (ill. 1), appointed director of the Frick Collection last 3 October 2011. At 60 years old, he comes from the Metropolitan Museum where he was chief curator for the Department of European Sculpture and Decorative Arts and where he ran unsuccessfully for head in 2008 (see news item of 9/9/08). Previous to joining the Met in 2001, Ian Wardropper worked for almost twenty years at the Art Institute in Chicago where he ended his stay as director of the Department of European Sculpture, Decorative Arts and Antique Art. He will be replacing Anne L. Poulet who is retiring after eight years of loyal service (see news item of 8/08/03 in French). Before leaving however, she was able to acquire two important works for the museum. 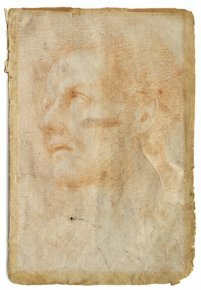 The first is a double-sided drawing by the Sienese artist, Domenico Beccafumi (ill. 2), donated by Barbara G. Fleischman, representing the head of a man on the front and a sketch of the façade of the Palazzo Borghese in Siena on the back. Dating from around 1512-1514, this study of a face has been compared to the figure of a beggar visible in the predella of the famous altarpiece, The Stigmata of Saint Catherine (c. 1513-1515, Siena, Pinacoteca nazionale) ; however this ecstatic likeness with the eyes looking up appears frequently in Beccafumi’s oeuvre, so that it is difficult to associate it with a figure in a specific work. On the back, the study of the Sienese palace reminds us that the painter executed a complex decoration, between 1512 and 1514 for the building’s façade, familiar to us today thanks to Vasari’s description in his Lives and also a drawing held at the British Museum. The Frick Collection study would seem to come from a sketchbook discovered in London in the 1920’s, attributed to Beccafumi in 1935 and acquired by Thomas Agnew who committed the sacrilege of selling the sheets one by one in 1965. It rounds out the museum’s Italian graphic collections which contain few works but of very beautiful quality, notably by Pisanello, Titian, Tiepolo, as well as the Sienese, Duccio, Barna da Siena and Vecchietta. 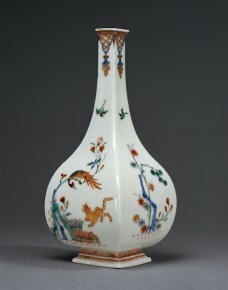 The second piece to recently join the holdings is a Vase Japon (ill. 3), partly purchased by the Frick Collection and partly donated by Alexis and Nicolas Kugel in honor of Anne L. Poulet. In hard-paste porcelain, with a baluster form on a small pedestal, it shows a gilt decor on an orange background with motifs of trellises, crossbars, petals and flames ; produced by the Royal Manufactory of Sèvres in 1774, it bears the stamp of the master silversmith Charles Ouizille (Marie-Antoinette’s jeweler), while the gilding was by Jean-Armand Fallot, active in Sèvres between 1765 and 790. Both in its form and its decor, the inspiration for this vase comes from the Chinese Hu or You model of the Han dynasty (206 B.C. - 226 A.D.), produced in bronze or terracotta. 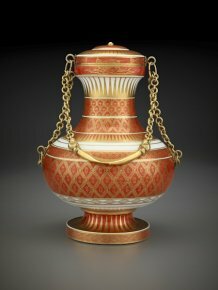 There are only two other known vases, making a pair, similar to this one in form and decor ; also dated from 1774 and bearing Fallot’s stamp, they do not have a chain nor a vermeil handle, but present porcelaine rings. This spectacular piece is a welcome addition to the Frick Collection which did not own until now any hard-paste porcelain from Sèvres. 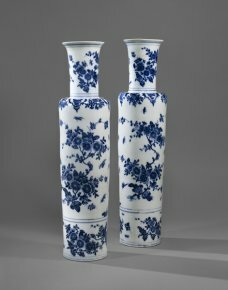 In fact, it will be spending some time with a selection of seventy works from the famous Henry Arnhold porcelain collection which will be presented at the Frick Collection from 13 December 2011 until 29 April 2012. This exhibition, entitled "White Gold : Highlights from the Arnhold Collection of Meissen Porcelain" will offer a glimpse of 131 Meissen porcelain pieces which are to be donated to the museum by the collector as a promised gift (ill. 4 and 5). The idea of creating a gallery of decorative arts and sculptures was suggested as a result of this donation of a promised gift. 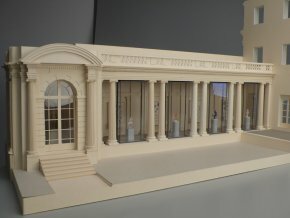 This new space, the museum’s first major expansion in almost thirty-five years, will also open next December and will occupy the garden portico (ill. 6) on Fifth Avenue, which will therefore be closed off and integrate the rest of the building following the project designed by Aedas architects. This extension materializes the intention of Henry Clay Frick (1849-1919) of building an exhibition space for his growing sculpture collection. After acquiring a property adjacent to his residence on One East 70th Street in 1915, he asked the architect Thomas Hastings to draw up plans for a possible addition. The project was interrupted by the outbreak of WWI, then forgotten with the death of Mr. Frick in 1919, but the designs remain. Besides H. Arnhold’s porcelains, the new gallery will also welcome for example Houdon’s Diana which underwent a scientific analysis and cleaning for the occasion. will be, designed by Aedas architects and planners for the project. Two recent publications provide a new look at the museum collections. The first, in English, appeared last September and studies Fragonard’s famous paintings, Fragonard’s Progress of Love at the Frick Collection  ; the other is a guide in French of the Frick Collection published with the help of the BNP Paribas Foundation, written by the curators. This is not a catalogue of the works (there are over one thousand items in the collection) but describes each of the departments : first of all painting with the different schools, Italian, Northern European, Spanish, French and English ; then the sculptures with Renaissance busts, bronzes of the 16th and 17th centuries, works from the 18th century ; the art objects comprise clocks, enamels and ceramics, then Renaissance furniture, 17th and 18th century furniture and decorative arts ; Chinese porcelain and Oriental rugs ; last, works on paper offer only brief comments. 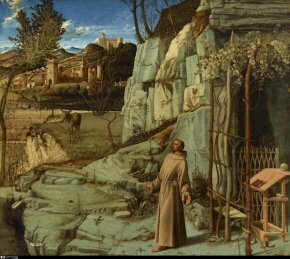 One of the museum’s many masterpieces, the enigmatic Saint Francis in the Desert by Giovanni Bellini (ill. 7) was studied in March 2010 by the Center for Conservation of Paintings at the Metropolitan Museum of Art and was highlighted in a special-study exhibition in the Oval Room between March and August 2011. The wood support, the underlying drawing and the pictorial layer were analysed minutely in order to understand the painter’s style, the differences between the idea and the execution as well as the subtle nuances of the iconography which does not correspond to the traditional representation of the saint kneeling before a seraph and receiving the five stigmata of Christ’s passion. While two small red points can be seen on Francis’ hands, there are none on his feet or breast and a seraph does not appear in the composition. An x-ray exam and radiographic test revealed that the support is made up of three horizontal boards of different sizes ; the one on top has been cut off. Was the seraph in the missing part ? No, because it measures only a few centimeters. Were the stigmata on the hands added on at a later date ? A microscope analysis found that the two red spots are original and detected traces of red paint on the left foot, invisible to the naked eye ; however, no sign of a stigma was found on the breast. We are led to think that the artist decided to interpret the saint’s wish to resemble Christ not by showing the suffering of the body but rather the fervor of his spirit : Saint Francis’ look is that of a blind man, haunted by an interior vision, while the rocks around him seem to tremble and stir ; we feel a force strong enough to move mountains. Collective work : La Frick Collection New York, MMF and RMN, 2011, 128 p., 23€. ISBN : 9782711856565. Colin B. Bailey, Fragonard’s Progress of Love at the Frick Collection, GILES, 2011, 192 p., 29.95£ / $44.95. ISBN : 9781904832607. We have not yet seen this work and cannot therefore offer a review.